Amazon.com has put up its official Vado HD product page! 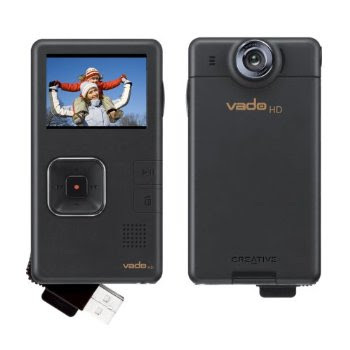 As predicted, the Vado HD will retail at US$199 which is cheaper than the Flip Mino HD ($239). There's not many new surprises here, with all the features as per what we have predicted in our previous post. What's new now is that there's an option for you to choose if you would like to record in HD (2hours) or VGA quality (4hours). However, you might not get a set in time for christmas as the product will only arrive after December 24th. The Vado HD package now comes with HDMI cable, silicone skin and a USB extension cable. If you're living in the US, order your set online today!